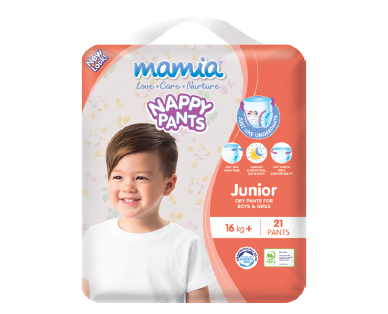 Junior nappy pants 16kg+, 21pk. MAMIA® nappy pants are shaped to fit, featuring a contoured Triple Layer Core. Enhanced by comfortable leg elastics and leak guards, you have peace of mind your child is protected while at play, or asleep. The 360° stretch design ensures a secure fit, whilst the stretchy sides allows your toddler freedom to move. With easy tear away side seams helps to make change time as quick and easy as possible. MAMIA® has a soft top layer that is suitable for sensitive skin, helping to reduce irritation and increase comfort for your toddler. The high performance absorption layer rapidly draws moisture away from the skin, and into the lock-away core. MAMIA® nappy pants are also unisex, so they are great for both girls and boys.